Cesar R. Nuñez is the philanthropist being honored today, the 5th day of World Orphan Week. Interestingly enough today’s honoree is also from Honduras. 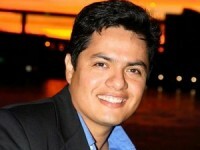 Cesar was born in Tegucigalpa and moved to the United States with his mother in 1986. He is a Photojournalist, Producer, Director and Filmmaker extraordinaire. Over the years Cesar has covered thousands of stories all over Latin America and the Caribbean. During his trips his heart strings were forever being pulled every time he saw a child in need looking through the garbage for something to eat. A stark reminder of Cesar’s childhood days. No, Cesar is not an orphan. On the contrary Cesar was blessed to have been raised with his 7 siblings by a doting mother and loving father. No lack of love in his household, just the lack of food and basic essentials. Cesar marveled at dinner time and always wondered how his parents were able to put food on the table. They were beyond poor, they were destitute. Cesar used to comb the city dump and garbage cans in search of anything he could sell. He became known as the little bottle boy as he went door to door trying to sell bottles he found at the dump so he could help his parents provide food & school supplies for his brothers and sisters. Riveting images of hungry children haunted Cesar throughout his travels and prompted him to come up with a plan. From 1992 up to 1998 Cesar had already helped 500 orphans receive proper care. Cesar scrimped and saved and in 1998 he provided the seed money to launch Angels Helping Angels along with the sweat equity that was provided by Cesar’s beloved brother. Angels Helping Answers is a volunteer based non profit. All of the money raised goes to help children in need. With the help of family and friends Angels Helping Angels has provided countless donations and emergency supplies for children in need and countries in crisis. Over the past 25 years Cesar has volunteered countless hours of his time to the Red Cross, Boy Scouts of America, Honduras World Foundation, Brothers to the Rescue, Smile of a Child among other non profits. All the while he also managed to forge a successful TV career at Univision, CBS 4 and the City of Miami. He is a five times Academy Emmy Award Winner with 14 nominations in the television industry. Many of Cesar’s award winning documentaries are about life safety matters and the plight of orphaned and abandoned children. I was blessed to have watched one of his documentaries and learned that a hammer can save your life if your car ends up in a canal. Miami is full of canals and our roads are slippery when it rains. It rains a lot in Miami and one never knows. To this day, thanks to Cesar, I keep a hammer under my driver’s seat. My hat is off to you Cesar for your many years of outstanding achievements and for your tireless dedication to helping save lives and helping children in need. Stay tuned to for Cesar’s YouTube Debut which is coming soon. His life saving videos are a must see!